(Phys.org)—Is it possible to engineer self-replicating nanomaterials? It could be if we borrow nature's building blocks. DNA is a self-replicating molecule where its component parts, nucleotides, have specific chemical interactions that allow for the design of self-assembled structures. In biological systems, DNA replicates with the aid of proteins. However, Junghoon Kim, Junwye Lee, Shogo Hamada, Satoshi Murata, and Sung Ha Park of Sungkyunkwan University and Tohoku University have designed a controllable self-replicating system that does not require proteins. Their work appears in Nature Nanotechnology. To understand how this self-replicating process works, it is important to know the different component parts. Kim et al. designed two DNA T-motifs, r1 and r2, which are double-stranded DNA comprised of functional domains, labeled alpha and beta, and "sticky" ends as connection points. They also designed an extension motif. Twelve units of the r1 motif self-assemble into a small ring, R1, and twelve units of r2 plus twelve extension motifs self-assemble into a larger ring, R2. These components can be in two different states, "fertilized" or "unfertilized". The fertilized structures contain the features necessary for replication. Fertilization happens when a single-stranded alpha or beta domain of an r1 or r2 motif binds with a strand having a complementary alpha or beta domain. This leaves a single-strand protrusion, or toehold, extending from the ring or from the original motif. The toeholds indicate that the ring or motif is fertilized. These toeholds extending from the DNA ring bind to complimentary invader strands. When this happens, the hybridized structure consisting of the toehold and the invading strand breaks off of the initial ring, and eventually, as these pieces break off due to branch migration, they self-assemble into another ring. This process continues through two different replication pathways. One pathway grows exponentially. The other pathway grows according to Fibonacci's sequence. The particular pathway taken depends on which invading strands are added to the system. The authors verified that the DNA ring populations grew through this toehold-mediated process with AFM and absorbance studies. For the AFM studies, they took a small sample from each phase and determined the average number of rings present in that phase. Absorbance data was adjusted to determine the relative concentration of rings at each phase. They also verified that the daughter rings were a result of annealing to the single-strand toeholds from the initial ring rather than as a result of self-assembly of residual DNA motifs in solution using gel electrophoresis and extracting the DNA products from each phase. The individual phases were studied with AFM and invading strands were added to a solution during each of the phases to see if rings formed. Kim, et al. demonstrated that nanoscale self-replication can occur using the thermodynamic properties of toehold-mediated strand displacement and the self-assembly abilities of DNA motifs. In this study synthetic DNA T-motifs self-assemble into structures that allow for sequential reactions to take place. This research demonstrates the possibility of functionally programmable self-replicating nanostructures. Biology provides numerous examples of self-replicating machines, but artificially engineering such complex systems remains a formidable challenge. 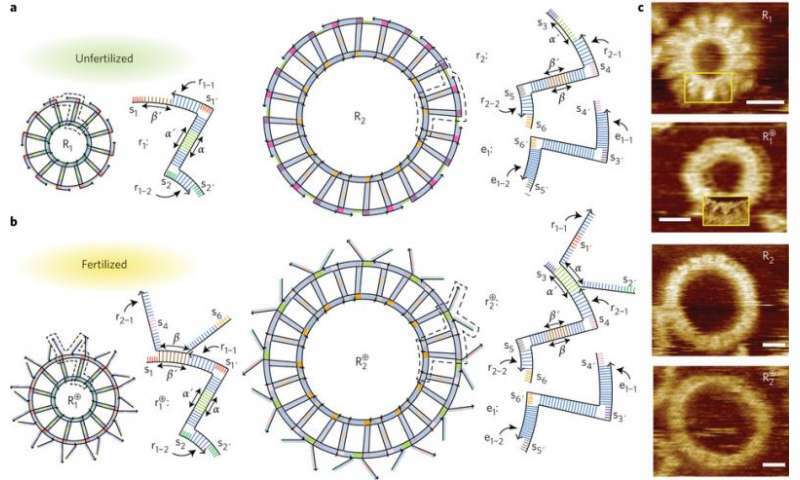 In particular, although simple artificial self-replicating systems including wooden blocks, magnetic systems, modular robots and synthetic molecular systems have been devised, such kinematic self-replicators are rare compared with examples of theoretical cellular self-replication. One of the principal reasons for this is the amount of complexity that arises when you try to incorporate self-replication into a physical medium. In this regard, DNA is a prime candidate material for constructing self-replicating systems due to its ability to self-assemble through molecular recognition. Here, we show that DNA T-motifs, which self-assemble into ring structures, can be designed to self-replicate through toehold-mediated strand displacement reactions. The inherent design of these rings allows the population dynamics of the systems to be controlled. We also analyse the replication scheme within a universal framework of self-replication and derive a quantitative metric of the self-replicability of the rings. TLR9: Two rings to bind them? DNA is not self replicating molecule. The complex process of replication of genetic information recorded in DNA involve many molecular machines in the cell. One pathway grows exponentially. The other pathway grows according to Fibonacci's sequence. Why does this matter? It means that the difference between test tube and tanker car amounts depends on the food (r1 and r2) available, and the doubling time is constant, no matter which growth pattern is followed. Which consist of proteins formed out of DNA. Cells may have lost the necassary code to bootstrap their own replication by building the machinery to do it, but that doesn't mean DNA is incapable of self-replication. DNA is not like an inert ticker-tape of a computer that does nothing until it is read by the machine - it undergoes chemical reactions of its own. "Which consist of proteins formed out of DNA". Several dozens of complex proteins that are involved in the synthesis of proteins required for the structure and proper operation of the cell and organism , are also encoded in the DNA. But without their participation complicated multi step complex synthesis of proteins in the cell is not possible. DNA alone can not replicate itself. Process of duplication of DNA is very complex organized, exactly synchronized and involves many different complex proteins (enzymes). But this proteins ca not emerge by random events on tхе same place in the same time in the external environment. The physical laws do not tolerate such processes and probability for this is practicaly zero. DNA is only convenient carier of usefull information needed for the proper function of the cells. But this information which determine the degree of order in a system always comes from intelligence. DNA alone can not replicate itself. RNA does. It simply attaches to free nucleotides and forms a mirror copy of itself, which then detaches and forms another mirror which is identical to the original. The process of replicating DNA is not fundamentally different. It involves the use of one relatively simple enzyme to split the strand apart into RNA, and after that the mechanism is the same. This is what is used in the laboratory for DNA amplification to multiply a strand many times over. The complex machinery in the cell is due to the need for error correction and the speed and efficiency of the process, not because it's absolutely necessary to have such complexity for the thing to work. In fact, the polymerase chain reaction works at elevated temperatures closer to the boiling point of water, and functions on alternate heating and cooling to physically split and recombine the strands. Basically, what happens is that the DNA strands are denatured or split apart by heat, and then the temperature is lowered, at which point the RNA style replication can happen spontaneously. In the lab, they use a DNA polymerase to selectively copy certain marked regions of the DNA for further analysis. This is not absolutely necessary though, and if left alone the free strands would form copies of DNA on their own albeit at a slower rate and with more random recombination. In an environment like a hot thermal vent on the sea bed, the hot water can drive DNA splitting and recombination cycles until a suitable strand forms that can catalyze the process itself, forming the first DNA copying mechanism. Such an elementary DNA polymerase enzyme is essentally a cellular automaton - it contains only a very simple list of instructions or states. Such machines can nevertheless produce immensely complex patterns when you feed them a suitable starting "tape" and keep adding more building blocks. "RNA does. It simply attaches to free nucleotides and forms a mirror copy of itself, which then detaches and forms another mirror which is identical to the original. " What proves this? Autor of this article talk about DNA based self replicatin nano particles. But in real world do not exist living organisms whose genetic information is stored in RNA. Only some viruses rely on RNA as a carrier of their genetic information, but they are not living organisms at all and do not possess their own metabolism. They rely on DNA based organisms and therefore can not have emerged earlier than these organisms. RNA viruses can not replicate outside the DNA based organisms, which indicate that RNA self replication is problematical in external environment. Viruses protective envelop is certain evidence that their genetic information stored in RNA or DNA vulnerable and could not survive long exposed to conditions of external environment.